"Go Your Own Way" is a song by the British-American rock band Fleetwood Mac, released as a single in December 1976. Written and sung by Lindsey Buckingham, it was the first single from the group's 1977 album Rumours. It was the group's first major U.S. hit with male lead vocals. It was hardly a vacation. Aside from the obvious unstated tension, I remember the house having a distinctly bad vibe to it, as if it were haunted, which did nothing to help matters…and that's where Lindsey played some of his stuff for the album. It was rough but it was great, though the setting didn't do it justice..."
The band didn't hear any of these early recordings until they returned to Sausalito. Buckingham had heard "Street Fighting Man" by The Rolling Stones, and he thought that type of drum approach would work well for the song. Ken Caillat, remembers that Mick Fleetwood initially had a difficult time with the drums. "I remember watching him guide Mick as to what he wanted – he'd be so animated, like a little kid, playing these air tom fills with his curly hair flying. Mick wasn't so sure he could do what Lindsey wanted, but he did a great job, and the song took off." The guitar solo was assembled in numerous takes at Criteria Studios by Ken Caillat, Fleetwood Mac's producer at the time. "It was a completely comp'd solo, and on the 24-track it's still in its original form, with all the separate guitars, and you still have to mix that way. I remember, I'd gone away for Christmas vacation and got snowed in at Lake Tahoe, and when I finally returned I got a midnight call telling me to come to the studio because they'd been trying to mix that song and couldn't build the guitar solo. So I drove there and did the solo, using mutes and faders while also having two solos play simultaneously for certain parts, such as one toward the end where he does this slide." The song is about the complicated relationship that Buckingham and fellow Fleetwood Mac member Stevie Nicks were having. None of the members knew they were writing songs about each other until the album was released. Stevie Nicks asked Buckingham to remove the lyrics "Packing up, shacking up is all you wanna do", but Buckingham refused. In an interview with Rolling Stone magazine, Nicks gave her thoughts on the matter. "I very much resented him telling the world that 'packing up, shacking up' with different men was all I wanted to do. He knew it wasn't true. It was just an angry thing that he said. Every time those words would come onstage, I wanted to go over and kill him. He knew it, so he really pushed my buttons through that. It was like, 'I'll make you suffer for leaving me.' And I did." 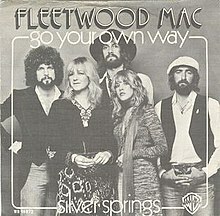 Although the release date for Rumours was set for February 1977, Fleetwood Mac wanted a single out by Christmas; "Go Your Own Way" was chosen to fulfill that role. This marketing move would prove to be very successful. Before the album's release, pre-orders had reached 800,000 copies, the biggest advance sale in Warner Brothers' history at the time. B. Mitchel Reed, a popular DJ in LA in the 70s, was underwhelmed when he first played the single on his program. After the song had finished, he said dismissively to millions of listeners: "I don't know about that one". Afterwards, Buckingham contacted Reed, demanding to know what the problem was. Reed told Buckingham that he could not find the beat. Both Fleetwood and Buckingham took the blame for this issue. Buckingham attributed the problem to the acoustic guitar track that he added late into production. While he felt that the acoustic guitar glued the whole piece together, its unusual entrance created confusion over the location of beat one. As soon as I came up with the acoustic part, the whole song came to life for me because it acted as a foil for the vocals and a rhythmic counterpoint…so when it comes in, you don't have a reference point for where the "one" is, or where the beat is at all. It's only after the first chorus comes in that you can realize where you are – and that's what that deejay was confused about. "Go Your Own Way"s rhythm was a tom-tom structure that Lindsey demoed by hitting Kleenex boxes or something...I never quite got to grips with what he wanted, so the end result was my mutated interpretation. It became a major part of the song, a completely back-to-front approach that came, I'm ashamed to say, from capitalizing on my own ineptness. I've watched, I've tried to understand it. Nothing you do up there makes sense, but it sounds beautiful. What's your method? What are you doing in that last fill of "Go Your Own Way"? I can't figure it out! I've been watching every night. What do you do in the last measure on that last beat? Is the snare ahead or behind? Is the hi-hat off by two quarters or is a little more than that? Jeff Porcaro was initially dubious, and found it hard to believe that Fleetwood, a drummer he admired, had no clue what he was doing. "It was only after we continued to talk that Jeff realized I wasn't kidding around. We eventually had a tremendous laugh about it, and when I later told him that I was dyslexic, it finally made sense." Like their last two singles from the album Fleetwood Mac, "Go Your Own Way" became a hit in the US. The track made its first appeared on the Billboard Hot 100 chart dated January 8, 1977, where it entered at No. 71. Two weeks later, the single had already ascended into the top 40. On March 12, it reached its peak of No. 10, a position it held for two weeks. In the UK, the single was not as successful, only reaching No. 38. However, the song became popular in the UK over a longer period as Rumours received more radio airplay and it re-entered the singles chart as a digital download on several occasions beginning in 2009. In 2013, it was certified Silver in the UK for digital sales over 200,000 copies. In 2016, it was certified Gold for digital sales of over 400,000 copies. The song also hit the top 40 in many other countries, including the Netherlands and Belgium, where it hit No. 1. "Go Your Own Way" has received critical praise upon release. Daryl Easlea of BBC called Buckingham's compositions the best tracks on Rumours, "Go Your Own Way" included. Matthew Greenwald (of AllMusic) noted the song's folky sound, reminiscent of pre-Beatles bands like The Everly Brothers. He also heavily praises the lively chord changes and bombastic choruses. "All of these factors, plus a great performance from the band (especially Buckingham's exquisite guitar solo) helped make the song one of the band's biggest and most timeless hits, ever." It is ranked No. 120 on Rolling Stone's list of the 500 Greatest Songs of All Time and is on the Rock and Roll Hall of Fame's 500 Songs that Shaped Rock and Roll list. Three years after its first appearance on Rumours, a live recording was included on Live. This performance was recorded in Cleveland in 1979, and featured Ray Lindsey (Buckingham's guitar tech) on rhythm guitar. Its next appearance on a live album was 1997's The Dance. Seven years later, the song appeared on both the DVD and CD of Fleetwood Mac: Live in Boston. Throughout the years, "Go Your Own Way" has made its way onto numerous compilations, including Greatest Hits in 1988, 25 Years - The Chain in 1992, The Very Best of Fleetwood Mac in 2002, and "Opus Collection" in 2013. "Go Your Own Way" has been covered by several artists, including NOFX, The Lumineers, Vomit Launch, Seaweed, The Cranberries, Jellyfish, Jennifer Brown, Wilson Phillips, Biffy Clyro, Carrie Underwood, Boy George, Kate Ceberano, Silverstein, Keane, Lea Michele, Lissie, Head and the Heart, Colbie Caillat, Art of Dying, Kingswood and Rawr Vanity. Canadian artist Karl Wolf sampled the refrain from the song in his single "Go Your Own Way" with additional music and lyrics. The single appears on his album Stereotype. ^ Fleetwood, Mick; Bozza, Anthony (October 2014). Play On (First ed.). New York, NY: Little Brown and Company. p. 187. ISBN 978-0-316-40342-9. ^ Bosso, Joe. "Fleetwood Mac's classic album Rumours track-by-track". Musicradar. Retrieved March 17, 2015. ^ a b Buskin, Richard. "Fleetwood Mac 'Go Your Own Way'". SOS. SOS Publications Group. Retrieved May 12, 2015. ^ Evans, Mike (2011). Fleetwood Mac - The Definitive History. New York, NY: Sterling. pp. 154–155. ISBN 978-1-4027-8630-3. ^ a b c d Robbins, Patrick. "Five Good Covers: Go Your Own Way (Fleetwood Mac)". Cover Me. Cover Me. Retrieved April 18, 2015. ^ Bosso, Joe. "Mick Fleetwood: my 11 greatest recordings of all time - Go Your Own Way". musicradar. Future Publishing Limited. Retrieved May 10, 2015. ^ Fleetwood, Mick; Bozza, Anthony (October 2014). Play On: Now Then & Fleetwood Mac. 1290 Avenue of the Americas, New York, NY 10104: Little, Brown and Company. p. 15. ISBN 978-0-316-40342-9. ^ Fleetwood, Mick; Bozza, Anthony (October 2014). Play On: Now Then & Fleetwood Mac. 1290 Avenue of the Americas, New York, NY 10104: Little, Brown and Company. pp. 15–16. ISBN 978-0-316-40342-9. ^ "Fleetwood Mac". officialcharts.com. The Official UK Charts Company. Retrieved 8 January 2017. ^ Easlea, Daryl. "Fleetwood Mac Rumours Review". BBC. Retrieved August 18, 2015. ^ Greenwald, Matthew. "Fleetwood Mac - Go Your Own Way". AllMusic. Retrieved December 4, 2016. ^ "Fleetwood Mac, 'Go Your Own Way' - 500 Greatest Songs of All Time". Rolling Stone. Rolling Stone. Retrieved April 17, 2015. ^ "500 Songs That Shaped Rock". infoplease. Pearson Education, Inc. Retrieved April 17, 2015. ^ "Fleetwood Mac - Go Your Own Way (Vinyl)". Discogs. Retrieved July 9, 2015. ^ "Fleetwood Mac - Go Your Own Way (UK Vinyl)". Discogs. Retrieved August 18, 2015. ^ "Fleetwood Mac: Awards". AllMusic. Retrieved May 14, 2015. ^ "Fleetwood Mac > Artists > Official Charts". Official Charts Company. Retrieved 5 May 2013. ^ Recording Industry Association of New Zealand. "charts.org.nz - Fleetwood Mac - Fleetwood Mac in New Zealand Charts". charts.org.nz. Archived from the original on August 26, 2015. Retrieved May 28, 2015. ^ "dutchcharts.nl - Fleetwood Mac - Fleetwood Mac in Dutch Charts". dutchcharts.nl. November 9, 2009. Archived from the original on 2012-10-25. ^ "Results-RPM-Library and Archives Canada". Library and Archives Canada. Retrieved May 13, 2015. ^ Musicline. "Musicline.de - Chartverfolgung - Fleetwood Mac" (in German). musicline.de. Retrieved May 28, 2015. ^ "Ultratop Belgian Charts - Fleetwood Mac". Ultratop. Retrieved October 26, 2015. ^ Rivadavia, Eduardo. "More Cowbell Songs". Ultimate Classic Rock. Retrieved October 28, 2015. ^ Stubbs, Kenneth. "Rock Band 2 Cheats, Codes & Guides". GamesRadar. Future US, Inc. Retrieved April 19, 2015. ^ "Guitar Hero World Tour full set list revealed". GameSpot. CBS Interactive Inc. Retrieved April 19, 2015. ^ "NOFX cover of Fleetwood Mac's Go Your Own Way". WhoSampled. Retrieved March 21, 2015. ^ Filbin, Patrick. "The Lumineers Cover Fleetwood Mac's "Go Your Own Way'". Paste Magazine. Paste Media Group. Retrieved March 19, 2015. ^ "Vomit Launch - Go Your Own Way Live". last.fm. Retrieved March 19, 2015. ^ "Go Your Own Way By Seaweed on Sub Pop Records". Sub Pop. Sub Pop Records. Retrieved April 16, 2015. ^ "The Cranberries - Go Your Own Way". Last.fm. CBS Interactive. Retrieved April 15, 2015. ^ "Video Jellyfish - Go Your Own Way - Live in Frankfurt, Germany". 2K music. 2K14. Retrieved April 16, 2015. ^ "Jennifer Brown "Go Your Own Way" Lyrics". Lyrics Box. LyricsBox. Retrieved April 16, 2015. ^ Gabel, Sue. "Wilson Phillips performing for one night only at the Snoqualmie Casino Ballroom". axs. Retrieved March 19, 2015. ^ a b c d e "Go Your Own Way by Fleetwood Mac Statistics". setlist.fm. Retrieved April 20, 2015. ^ "Video Kate Ceberano "Go Your Own Way"". 2Kmusic. 2K14. Retrieved April 29, 2015. ^ "Keane - Go Your Own Way (Fleetwood Mac) - Live on BBC Radio 2 (2010-05-10)". Youtube. Retrieved April 29, 2015. ^ Marsi, Steve. "Glee Sneak Peek: Lea Michele Belts Out "Go Your Own Way"". TV Fanatic. TV Fanatic. Retrieved April 29, 2015. ^ "The Head & The Heart cover Fleetwood Mac". Retrieved March 27, 2013. ^ "» ISUZU Artist: Kingswood Track: Go Your Own Way". Retrieved 2017-02-22. ^ YouTube KarlWolfVEVO channel - "Go Your Own Way"